One day after his birthday the Unruly boss Popcaan released his highly anticipated second album titled Forever. It was released via Mixpak and if you haven’t heard it yet first go listen it on iTunes or Spotify and then come back to this video. The album has received mix reviews and we’re gonna let you know what we thought on this 17 track album. Poppy had already released “Wine for Me,” “Firm & Strong,” and “Body So Good” so we won’t be covering those three. First two songs I wanna mention are A Wha Suh and Silence, to me those two songs are lyrically the most powerful. In A Wha Suh Poppy sings about the struggle, he mentions Delus and how you mustn’t mek badmind stop you. Now Silence that is some real talk, Poppy said: “Mi love my family but mi nuh trust di whole a dem. it might sound f up, but a so mi feel”. Lyrically this one way up there. This entry was posted in Dancehall News on July 21, 2018 by AngelMisierBadGyal. Jamaican dancehall artist Red Rat, also referred to as Double R, was in the Netherlands and we got a chance to hold a vibe with him! Red Rat, real name Wallace Wilson, was booked at the Hot Sunday Nights – Dancehall night at Club Mondial so we traveled to the south of the Netherlands to interview him and get some exclusive shots of him performing. He spoke candidly about the difference between 90’s dancehall and dancehall in 2016. Red Rat also gave his opinion on the dancer Marvin the Beast from Montego Bay, reminding us that women themselves are choosing him as a dancing partner. We spoke about going towards Sting 2016 and the Mavado / Popcaan / Demarco feud. It was amazing to see that Double R put into words the feelings many of us have about the current state of dancehall music. This entry was posted in Dancehall Artists on September 15, 2016 by AngelMisierBadGyal. In 2016 dancehall is showing up in places we’d never expect it and at times it’s a hybrid form that is barely recognisable as the sound we grew up on. 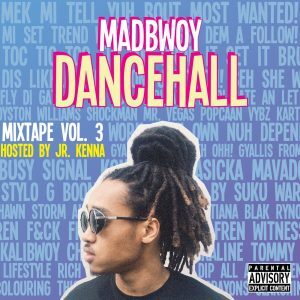 So you can imagine the joy I feel when discovering a mixtape that is committed to an authentic dancehall theme. As quite a lot of mixtapes were released around the same time I did not immediately listen to this one, however after seeing the amount of ?, ? and ? emoji’s accompanying the Madbwoy dancehall mixtape on my social media timelines I got curious. This entry was posted in Dancehall News on July 22, 2016 by AngelMisierBadGyal. We met up with the always charming king of dancehall, Beenie Man, in Amsterdam during his European Tour. We spoke about his album Unstoppable, a possible feud with Mavado and his love life. Including exclusive shots of his performance in Amsterdam. This entry was posted in Dancehall Artists on July 21, 2016 by AngelMisierBadGyal. Aidonia and Govana a.k.a. Deablo were at Jamrock for King’s Night! Things got hot on stage and in the crowd at Club Paradiso in Amsterdam on 26 April 2016. See for yourselves! This entry was posted in Dancehall News, Party Reports on June 23, 2016 by AngelMisierBadGyal. Dancehall Explorer met up with dancehall artist Aidonia in Amsterdam during his 2016 European Tour. In this in depth interview Aidonia speaks on the loss of his friend Lamar Dookie (Peak State), performing in Europe and his love for dancehall music. We have also included shots of his outstanding performance at Jamrock XL in Amsterdam where Aidonia invited JOP’s rising star Govana (formerly known as Deablo) on stage with him. This entry was posted in Dancehall Artists on May 23, 2016 by AngelMisierBadGyal. It’s Saturday 26 March 2016 and right now my right hand is hurting bad and my throat is sore. You wondering why? 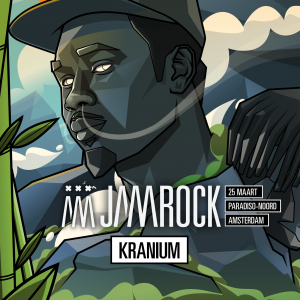 Well, let me tell you why…last night was the Jamrock XL party and the vibes were so gratifying, I found myself continuously banging my hand on the stage to big up the selector and singing shouting along to every tune. A party that was described as “dancehall heaven” (by @qsuze on Instagram) and that has kept me turnt till now. This entry was posted in Dancehall News on March 26, 2016 by AngelMisierBadGyal. Last year Soca vs Dancehall promised to look for a bigger venue to accommodate all the soca and dancehall lovers. Well, they most definitely kept their word as this year’s venue, Maassilo, was spacious and offered enough room for a proper tornado, palancing and all the ferocious wukking up. At the entrance there were plenty of lockers available to store wintercoats and valuables. Since most patrons were dressed in skimpy outfits ranging from batty riders to pyjamas to bath robes and February is well cold this was highly appreciated. While 2015 was already big with 700+ people in the venue, 2016 was significantly larger with 1000+ people attending Soca vs Dancehall’s Jouvert Morning. 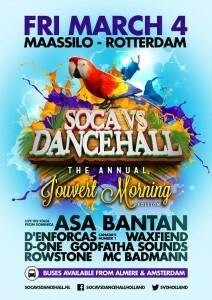 We hope next year’s Jouvert Morning will be at Maassilo again…or…can it get even bigger? This entry was posted in Dancehall News, Party Reports on March 25, 2016 by AngelMisierBadGyal.